"TEXAS DOG CHAIN BAN - OPPOSE SB295 & HB940"
The proposed Legislation, SB 295, and its identical House partner HB 940, basically add yet another layer of convoluted and arbitrary text to the already dysfunctional and unenforceable Texas Health & Safety Code that has plagued Texas Dog Owners for a decade. 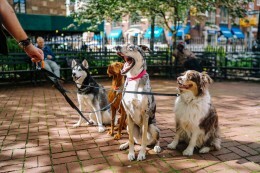 They add an outright BAN on using all chain for tethering purposes, which most dog owners know is the only material that larger breed dogs can’t chew through. So what’s the “core” of the problem that we’re trying to address in these Bills? TX Health & Safety Code Sec. 821.076, “Treatment of Animals & Restraint of a Dog”, originally introduced in 2007, attempted to define how to restrain your dog in a safe and humane manner. After being tossed around in Committees, normally staffed by non-canine folks, the resulting Code that Dog Owners were left to comply with is not only complicated, but literally unenforceable. You can’t tether a dog within 500 feet of a school? What? And even after all the effort a decade ago, the Code still didn’t address what type of “shelter” that most could agree and consider sufficient as a baseline to safeguard the animal’s welfare. Defining adequate shelter seems like a simple legislative task doesn’t it? Apparently NOT. In their usual over-exuberance, the Animal Activism Lobbyists and Lawyers have convinced some Legislators that every aspect of securing and sheltering a privately-owned Dog must be micro-defined. Several “tethering bills” have reared their ugly heads over the years, with more filed in the 2019 Session, with some pretty outlandish suggestions. Do we all want humane care for pets? YES. Do we all want to be told by our State Government what KIND of Dog House or Restraints that we have to use? NO. On their face, some parts of SB 295 & HB 940 sound reasonable. The dog needs a dog house. CHECK. The dog needs access to water. CHECK. So why on Earth would we rally you to oppose dog houses? Because there are a LOT of different kinds of dog houses! Some folks use their barn to keep their dog restrained when not at home, some folks may opt to use stock trailers, or sheds, or portable buildings. Are horse owners told what KIND of barn they have to build for their animals? NO. The repugnant SB 295 & HB 940 also ban the use of ANY type of chain for tethering a dog? Do any of these folks actually own a dog? They can CHEW through every other kind of tether! The object of restraining a dog is so that you don’t get a citation for it wandering the neighborhood. Tethering a larger breed dog with a string or light cable will NOT keep him at home. More importantly, because the original text of the TX Health & Safety Code is non-functional, adding yet more bad legislation on top of it, just makes it all a big rickety house built on a shaky foundation. It’s the Code itself that needs to be cleaned up before we can add more definitions and conditions. And that’s what the newly filed HB 4316 DOES do. It throws out the “500 feet from a school” clause, among other useless text in the old 2007 Code. What it ADDS, and this is important because it’s the crux of what most are complaining is missing, is that a restrained Dog must have access to “shelter”. SHELTER. And that’s all it needs to say! Let our Local Enforcement decide on a per case basis whether that shelter is suitable for their geography, the weather across massive Texas cannot be defined by region, so how do you arrive at one type of shelter that’s appropriate across the State? So YES, we can all agree that Texans approve of a dog’s baseline need of access to SHELTER, coupled with humane restraint methods to keep them from wandering at large. The wording in HB 4316 provides for this PLUS removes the old bad text. SB 295 and HB 940 DO NOT, plus add the horrific ban on the use of chain. Please click the link and send your letters to OPPOSE SB 295 & HB 940 directly to your Texas House Representatives and Senators. YOU MUST BE A TEXAS CONSTITUENT TO SEND THIS LETTER.